Coolstructures Cold Storage Panels offer unmatched flexibility for a broad range of cold storage applications, whether it be for cold storage warehouses and distribution centers , walk-in coolers / freezers, refrigeration - - or simply tight environmental control of any building. 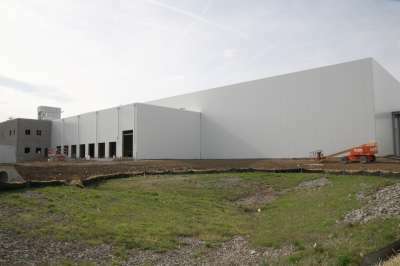 Coolstructures Cold Storage Panels are typically Insulated Metal Panels that utilize Coolstructures own expanded polystyrene as core insulation with a variety of metal or even FRP laminates. 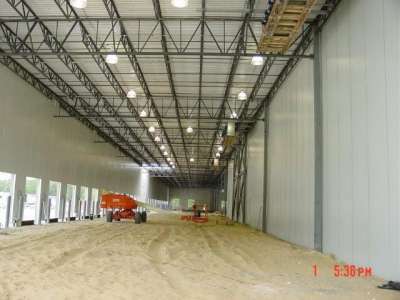 These composite wall panels can be used for cold storage walls (exterior, interior, and partition walls), roofs, floors, or doors in new or retro-fit contraction. And frequently Cold Storage Facilities must not only be thermally insulated, but they must be able to control bacteria, grease, or dust. Coolstructures's cold storage panels' food, meat, and floral related facilities are generally stainless steel or FRP skinned panels, with alternative textures that support a clean work environment. Coolstructures SIPs are highly washable, hygienic, resistant to mold & stains, and meet pertinent FDA regulations and USDA conditions. With our deep experience and industry knowledge, and alliances with construction companies across North America, Coolstructures is the preferred single-source provider of new or retrofit cold storage construction. Superior Thermal Efficiency: Nothing comes close to matching Coolstructures's energy-saving properties, where R-values up to 50 can be achieved with EPS(expanded polystyrene) cores - - providing the lowest cost per "R"of any similar panel product. Our cold storage design interconnection system reduces thermal bridging (heat loss), so prevalent in more complex designs. And our Cold Storage Panels actually increase in "R" value as the mean core temperature of the panel decreases. Variety of Dimensions: Offered in thicknesses between 2 and 12 inches. Coolstructures's continuous laminating line can manufacture panels in any desired length and to each jobs specific tolerance needs, with lengths up to 60 feet, Coolstructures's Cold Storage Panels can be custom-engineered to meet the most demanding project requirements. Strong and Lightweight: Coolstructures cold storage panels are incredibly strong, lightweight and easy to install, allowing for longer spans and lower installation costs. Choice of Laminates: Exterior skins are available in many prefinished skin colors and fabricated out of your choice of stainless steel, galvanized steel, or standard steel - - or FRP. Ease of Installation: Coolstructures's panels are a snap to install, using a simple "tongue-and-groove". Cold Storage Panels simply slide into place and are easily secured to the building's steel superstructure. In fact, Coolstructures Insulated Metal Panels are so strong and secure; they actually enhance the strength and rigidity of the structure. Panel Accessories: Coolstructures carries a complete line of panel accessories for Cold Storage Panels - - eliminating the need to procure materials from a third-party vendor.